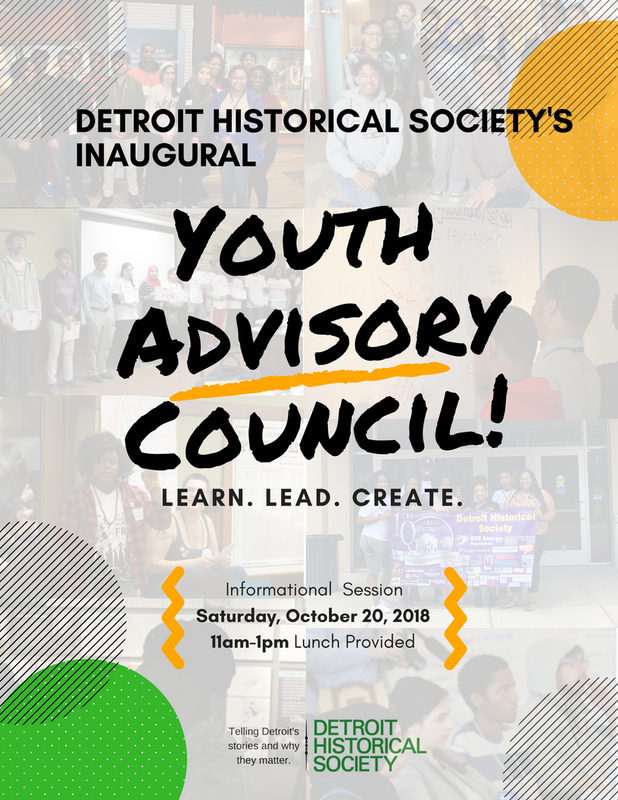 On Saturday, October 20, the Detroit Historical Society will host an informational session for its first ever Youth Advisory Council, designed for Detroit area high school students ages 14 – 18. Lunch will be provided. As a leadership group of DHS, the Youth Advisory Council will meet regularly throughout the year to learn the significance of Detroit’s unique story and history and how it related to present day, develop important leadership skills and weigh in on and develop public programming offered by the Detroit Historical Museum for both young people and adults. Youth Advisory Council Members will receive an honorarium for their active participation. Meals will be served during regular meetings. A Note for Parents, Teachers, Youth Advocates: This event is the third in a series of three youth-driven programs designed to equip young people as thought leaders and change agents in Detroit. The first was the Detroit Historical Society’s popular Detroit Design 2067 Youth Immersion & Leadership Development Program offered in April 2018. The second is Youth Summit that we’ll host at the Detroit Historical Museum on September 22.